For foodies around the world! As one of the largest hospitality providers in the world, we’re committed to providing accommodation for those wanting to explore what the world has to offer without the expensive price tag of a hotel. 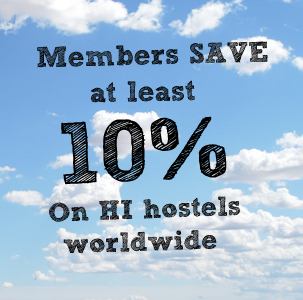 We have hostels in some of the world’s most desirable locations, where you can enjoy and explore the food the country has to offer, without worrying about the cost. 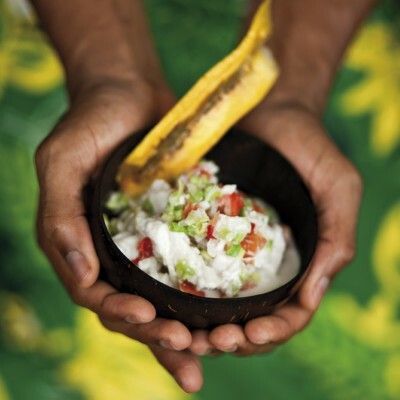 Not only is Fiji well-known for its beautiful beaches and rich culture, but also for its delicious food. The basic ingredients of Fijian food are rice, sweet potato, fish and coconut – all of which result in a variety of tasty combinations. One of the most traditional Fijian dishes is Kokada: steamed Mahi-Mahi white fish marinated in a lime, coconut and chili sauce, served on a bed of earth cooked vegetables. The Beachouse, located on Coral Coast is a truly unique resort hostel, designed and built by the Brown family in the 90’s specifically for those wanting a an authentic Fijian experience, away from the large commercialised resorts. Nestled within a coconut plantation with acres of tropical gardens and lawns, you can enjoy Kokada and many other traditional Fijian delights whilst sitting beside the pool, admiring the stretch of sandy white beaches around you. With just twenty double rooms and six small dormitories, visitors are able to enjoy the very best of Fiji’s coastal lifestyle in a quiet, relaxed environment. Italian cuisine has become one of the most popular in the world, however for real authenticity it’s worth visiting the country itself to experience it first-hand. Risotto is one of the more traditional dishes around the Venice/Venato area; a dish whose ingredients can vary quite significantly to include asparagus, pumpkin and seafood in coastal areas, and meat, peas and Parmesan in inland areas. 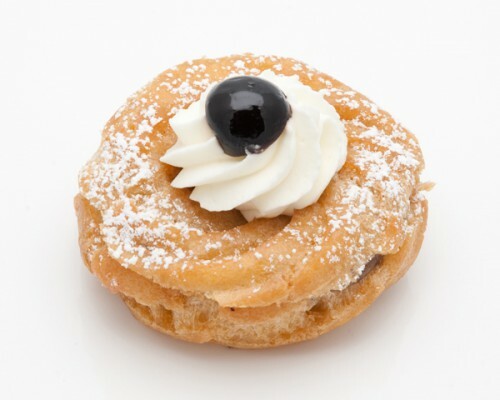 Other popular dishes include lasagna, pizza, strozzapretti and zeppola – a traditional desert which consists of a light fluffy donut-like pastry filled with custard, jelly, cream or a butter and honey mixture. Based in the ancient fishermans’ village of Torricella, Trasimeno Lake La Casa Hostel is in the perfect location to explore the delights that Italy has to offer. The hostel is in a private, quiet location – travellers need only to walk a short distance to find local restaurants, nightlife and galleries, where you are able to sample some of the delicious local dishes. Seafood risotto and traditional flat-bread pizza are some of the more popular local dishes, however a range of Italian cuisine can be sampled at the restaurants nearby. Whilst many may regard Japan as primarily famous for its raw fish sushi dishes, the country itself has far more to offer in terms of flavour and variety. For travellers visiting in winter, Oden is a popular ‘fast food’ dish containing fish cakes, eggs, seaweed and daileon noodles, whilst those visiting in the festival season could enjoy Yakisoba, a popular grilled noodle dish mixed with thinly sliced meat and cabbage, sprinkled with red ginger. 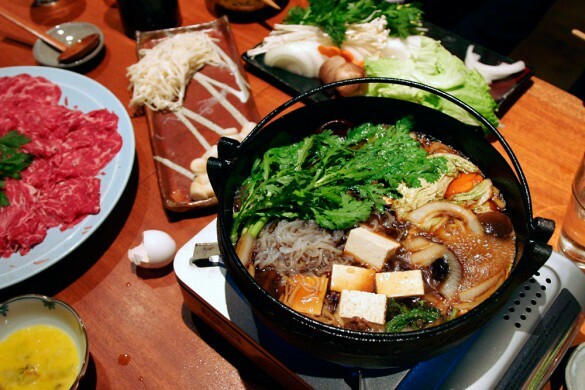 Sukiyaki is a traditional year-round food, consisting of mountain vegetables, tofu and noodles which are lightly simmered in a sweet soy sauce broth and dipped into beaten egg prior to serving. HI – Tokyo Central Youth Hostel is based in the very heart of Japan’s capital city, a great location for all visiting foodies who wish to try out what the country has to offer in terms of flavour. Located just one minute’s walk from the Tokyo Metro line, visitors also have the benefit of nearby transport. Prices start from £26.18 per night. To experience a more rural, traditional way of Japanese life, the Hostel Kyotofu is usefully situated in a farming village between Wakasa and Kyoto. The hostel itself is based in a thatched building close to wildlife, botanical gardens and a lake. In addition, there are several historical sites nearby to explore. Arabian-inspired cuisine is what’s primarily served in Bahrain, however, many local delicacies have their own twist. Muhammar, a sweet rice mix dish served with dates and sugar, is a popular side whilst Qoozi – grilled lamb stuffed with boiled egg, onion and sweet spices is a popular main. 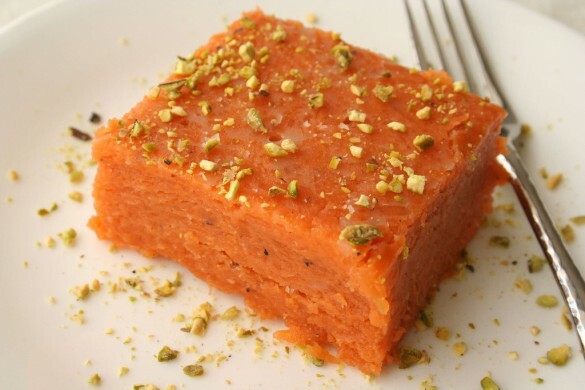 One of the more traditional desserts served is Halwa, also known as Halwa Bahrani. Made up of corn starch, saffron and nuts – it takes the form of a jelly like substance and is extremely sweet and moreish. Amwaj Islands is Bahrain’s brand new HI Hostel which has been completed to a high standard with a very modern, clean design throughout. The prime location of the hostel, within ten minutes of Bahrain International Airport, makes it a very popular destination – especially for those wanting to try out the local delicacies. There are no dormitories in this hostel, just six two-bedroom rooms and three one-bedroom rooms, making it the perfect quiet location for younger and more experienced travellers alike.